— Rachel Maddow on Tuesday, June 3rd, 2014 in comments on "The Rachel Maddow Show"
By Aaron Sharockman on Thursday, June 5th, 2014 at 5:00 p.m.
Rachel Maddow said, “The Pentagon made up” the heroics of POW Jessica Lynch as she tried to avoid capture in Iraq. As controversy swells surrounding the decision to swap five dangerous Taliban commanders for POW Army Sgt. Bowe Bergdahl, liberal MSNBC host Rachel Maddow is trying to defend the prisoner exchange by comparing it to the rescue of Iraq POW Jessica Lynch. On her June 3, 2014, show, Maddow explained Lynch’s story -- how her convoy had taken wrong turns in Nasiriyah, Iraq, in 2003 and was ambushed. And Maddow cited dramatic details in a Washington Post report that Lynch "fought fiercely and shot several enemy soldiers after Iraqi forces ambushed the Army's 507th Ordnance Maintenance Company, firing her weapon until she ran out of ammunition." But Lynch has since said that description is incorrect, saying her gun jammed in the chaos. Maddow highlighted the navigational mistakes of U.S. troops and the inaccurate story of Lynch’s heroics to draw a comparison to Bergdahl. "If the heroics that the Pentagon made up about her (Lynch) didn't really happen, and they didn’t, maybe the U.S. special forces who rescued her and the other Americans … maybe they shouldn’t have bothered," Maddow said, sarcastically. "After all, maybe it was sort of their own screw up that got them ambushed and hurt and captured in the first place. Is that how we think about these things now?" Some people who saw Maddow’s reporting questioned her assertion that "the Pentagon made up" Lynch’s heroism. The Pentagon is the building that houses the U.S. Defense Department and a quasi-official way to reference the Defense Department. Saying the Pentagon "made up" something is the equivalent of accusing George W. Bush's Defense Department. There is no question that much of the original Washington Post report, dated April 3, 2003, (Lynch was captured March 23 and rescued April 1) is inaccurate. The story said Lynch suffered multiple gunshot wounds and was stabbed. But doctors found no evidence of either. Lynch "was fighting to the death," a U.S. official told the Post, and she killed several Iraqis. But Lynch’s weaponed was jammed, and she killed no Iraqis. The Post reporting became the genesis "of a spate of stories that accepted the Post sequence of events," journalist Dante Chinni, who researched the issue, wrote for the Pew Research Journalism Project. "Many articles focused on the Rambo-like firefight Lynch reportedly engaged in — some even cited her valiant fighting as proof that women belonged in combat zones." Within a few weeks, however, the story had all but fallen apart. April 15, 2003: The Washington Post runs a piece questioning its earlier account. A physician from the Iraqi hospital that treated Lynch said, "There were no bullets or shrapnel or anything like that." April 18: An Associated Press story backs off earlier accounts. The AP quotes a military official who says the Lynch gunfight "has not been confirmed." May 15: A BBC News piece calls the Lynch story "one of the most stunning pieces of news management ever conceived." May 26: The Chicago Tribune continues to debunk the story of Lynch’s heroics. "The story of Jessica Lynch is the tale of how a modern war icon is made, and perhaps how easily officials and journalists with different agendas accepted contradictory, self-serving versions of what happened to her," the Tribune wrote. The Post relied on anonymous sources only described as "U.S. officials" in its initial report. 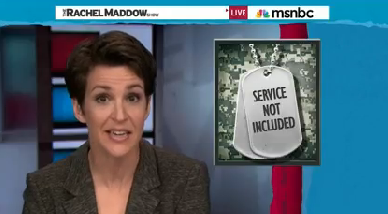 Maddow claimed the "Pentagon" made the story up. Actually, the story itself said the Pentagon couldn’t confirm the story. The original Post report, written by Susan Schmidt and Vernon Loeb, said that Pentagon officials "had heard ‘rumors’ of Lynch's heroics but had had no confirmation." Loeb described his sources as "some really good intelligence sources here in Washington." He said that after the information was proven to be false, the Post went back to reconstruct what happened. They found that the intelligence was coming from the battlefield and that U.S. officials had picked up on Iraqi "intercepts talking about a blind American firing back." Intelligence officials, who could include a number of people working at a host of different agencies, interpreted that blind American to be Lynch. Loeb was asked if he thought he was given the reports as part of an effort to mythologize Lynch. "No not at all," said Loeb, who is now managing editor of the Houston Chronicle. "I’ve been asked this over and over again. Our sources for that story were not Pentagon sources. In fact, I could not get anybody from the Pentagon to talk about those reports at all. I got indications that they had in fact received those intelligence reports, but the Pentagon was completely unwilling to comment on those reports at all. They wouldn’t say anything about Jessica Lynch. CNN's former senior Pentagon reporter, Jamie McIntyre, largely corroborated Loeb's account in a 2007 interview with Howard Kurtz. "Nobody in the Army could figure out where the information was coming from," McIntyre said. "There were no official statements that ever portrayed Jessica Lynch as going down fighting, and it appeared that the Post story was based on a single source who in retrospect may have confused the actions of other soldiers with Jessica Lynch. "Even in that original story it said that the Pentagon ... had heard rumors of this but couldn't confirm it." Maddow said, "the Pentagon made up" the heroics of POW Jessica Lynch as she tried to avoid capture in Iraq. Maddow was making the point that the United States should have rescued Lynch whether or not she was a hero, just like it was right to bring Bergdahl home. That may be a popular opinion, but Maddow missed on the details of Lynch’s now-debunked story. First, the original report Maddow pointed to -- an article in the Washington Post -- specifically said that the Pentagon couldn’t confirm the story. And later, the author of the Post report made clear that his source was not the Pentagon. Loeb, the author, went further to say he does not believe he was fed false information "to create a hero." The reality is we don’t know who provided the information to Loeb; he and his colleague Schmidt won’t say. Maddow fails to have the evidence to back up her claim. We rate it False. Added on June 10, 2014, 3:57 p.m.
Rachel Maddow responded to our fact-check of her on June 9, 2014. While Rachel Maddow did not respond to our requests for this fact-check, she did critique PunditFact’s work on her June 9, 2014, show. Maddow referenced three instances -- other than the Washington Post report she cited on June 3 -- where news reports quoted military officials as describing now-proven-false claims about Lynch. None of those reports, however, show that the "Pentagon made up" (definition: invent) the story, as Maddow originally claimed. A congressional oversight panel in 2007 could not prove a connection either. The additional accounts speak to a broader and more-substantiated belief that government officials played some role in furthering the false narrative of Lynch’s heroism. Maddow referenced this point twice on June 9, but did not acknowledge that it was different than what she claimed and we fact-checked on June 3. June 3: "If the heroics that the Pentagon made up about her didn't really happen, and they didn’t, maybe the U.S. special forces who rescued her and the other Americans … maybe they shouldn’t have bothered. After all, maybe it was sort of their own screwup that got them ambushed and hurt and captured in the first place. Is that how we think about these things now?" June 9: "So if you’re fact-checking whether or not military officials pushed a made-up story about Jessica Lynch’s heroism … Did the military provide false information that led to the narrative that Jessica Lynch went down fighting when she was captured?" The best details about the origin of the false information come from a Washington Post reporter, who says he received it from a U.S. official with access to military intelligence reports from the battlefield. We do not know if the story of Lynch’s heroism was made up, invented or communicated incorrectly. We do know, however, that the false information spread rapidly through media reports and the Post reporter said it did not come from the Pentagon. What was not conveyed by Maddow is that Thorp’s quote was examined as part of a 2007 congressional review of the Lynch matter. Thorpe told Democrats investigating the case that, "Media desperately wanted me to confirm the story that was running in the States. I never said I had seen any intel or even intimated the same … I may have said I’m familiar with ‘the reports’ meaning the press reports, but as you can see I did not confirm them." That inquiry by Democrats in the House of Representatives was unable to identify the source of the leak or whether reporters were willfully misled. On April 1, 2003, the Associated Press reported that an Army spokesman "did not know whether Lynch had been wounded." After the New York Times report the following day, other media reported that Lynch had been shot. Her family also said she had been shot. In this instance, it appears wrong information was coming from multiple sources. But again, it’s not clear if it was invented or simply erroneous. Published: Thursday, June 5th, 2014 at 5:00 p.m.